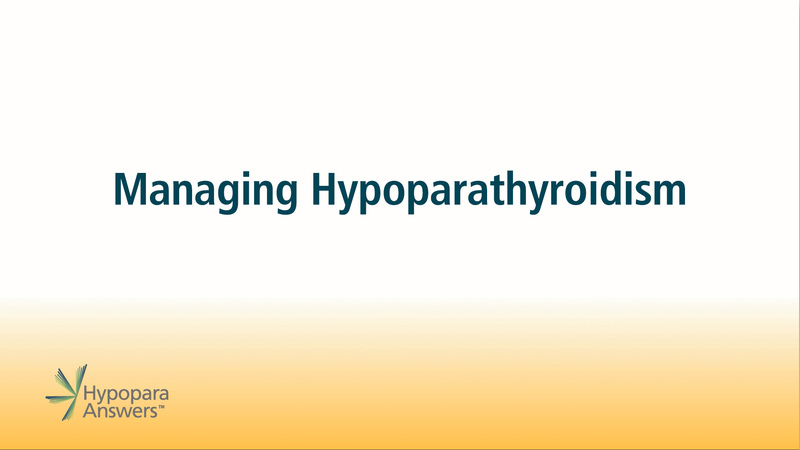 Hypoparathyroidism is complex but can be managed with help from your doctors. You and your doctor will work together to develop a plan to manage your condition. Your doctor may recommend dietary changes, supplements, or medicines to help maintain the balance of calcium in your body. You can help your doctors manage your condition by keeping a journal of symptoms that may help them identify patterns. Calcium and active vitamin D are the main tools used to keep calcium and phosphorus levels within a specified range to limit your symptoms and reduce the risk of complications. If calcium and phosphorus levels can be kept within a target range you should experience reduced symptoms. Increased or new symptoms could be a sign that blood calcium levels are out of balance. Your doctor might also consider other therapies. An important first step in effective management of your calcium levels is finding the right doctor or team of doctors. Hypoparathyroidism can affect many systems in your body. So, in addition to your primary care physician, your team may include an endocrinologist, a nephrologist (kidney doctor), and a surgeon. When first diagnosed, your doctors will determine the calcium levels in your blood and urine. Based on these levels and any changes in your symptoms, your doctors will make adjustments to your calcium and/or vitamin D intake and to your diet. Keep an open dialogue with your doctor so you can express how you're feeling. Control of hypoparathyroidism can be challenging. Patients often require very high doses of calcium and active vitamin D to control hypoparathyroidism, which can lead to concerns for potential complications. Some people, despite taking very high amounts of calcium and active vitamin D, can experience wide swings in serum calcium.